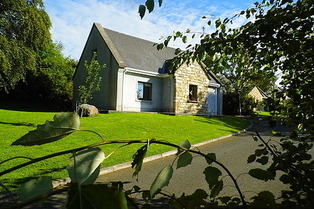 Lakeside Cottages Drumcong are situated in the heart of North West of Ireland, on the banks of Lough Scur. There are few places as tranquil and rich in natural beauty, than as you will find here at the foot of the Iron Mountains. There are plenty of amenities in the surrounding localities to occupy, even for the most adventurous of those amongst us. You could take the family for a walk or a hike in the mountains and still have time for a leisurely pint and some traditional Irish music in the local pub. For the active family they have fun activities. The four bedroom house has furnished living/dining area with the kitchen opening off it, at ground floor level two large bedrooms, one with twin beds and the other with a double bed. Both bedrooms have wardrobe and clothes storage facilities. Also at ground floor level is the main bathroom, which is a spacious room having a bath and in-bath shower. At first floor level is the master bedroom which is en-suite and a second double bedroom. The three bedroom deluxe house sleeps 6 people, while also having the capability to accommodate 8. This house is a bungalow. The living room is two story in height, with a mezzanine study area allowing peace for quiet reading. This area also has a sofa couch which can convert to a double bed for extra guests. The kitchen opens off the dining area and also has a direct access to the garden. There are three spacious bedrooms; the Master bedroom at first floor level has a king size double bed and its own ensuite with an electric shower and walk in wardrobe. The other two bedrooms are at ground floor level, one is furnished with a double bed and the 2nd with twin beds. There is a large bathroom opening off the hall, which also enjoys an in-bath shower. The three bedroom house, which sleeps 5 has a spacious living room, with a cathedral window giving spectacular views of Lough Scur. All bedrooms are well furnished, with plenty of storage. The master bedroom has a fine double bed and an en-suite with large shower, toilet and wash hand basin. Bedroom 2 has either a double or twin beds while bedroom 3 is a very spacious single room. A large bathroom serves the house. The kitchen opens as an annex off the living room. There is a Games Room with a selection of toys for the kiddies to play with. A football table and pool table are there for the older ones. Great for that rainy day. There is a outdoor jungle gym for the under 12′s. Wifi is available in and near the Games Room. A Bait Room with fridges and storage space is available for anglers. A private jetty at the lake, great to fish from or tie your boat up to. And there’s a slip to launch your boat .